Or, a day in Athens. Written on location in August. Sorry for not publishing before now. I’ve been a bit busy with the day job! A stopover in Athens is a treat, and for me was a chance to see again I city I last visited in 1992, and thought the world of despite nay-sayers loudly trumpeting its downsides. 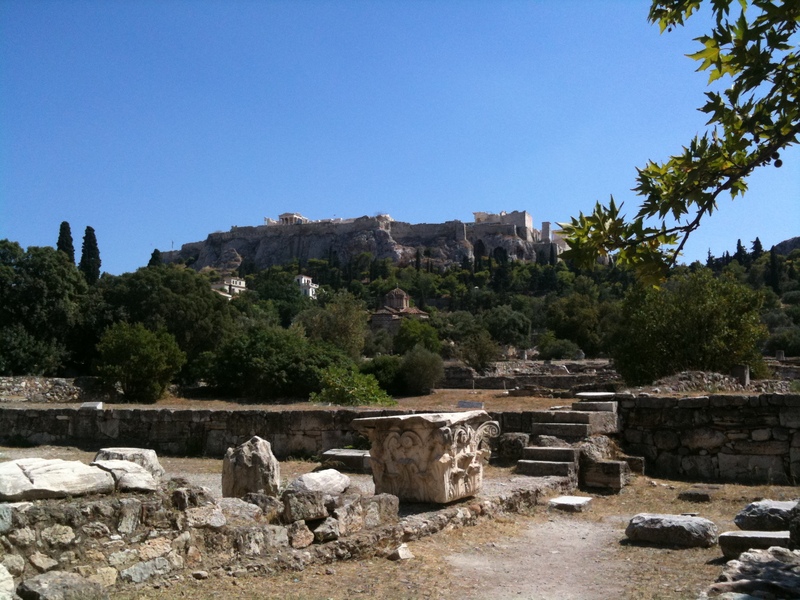 I loved Athens on that fleeting visit: the bright, slippery rock of the Acropolis, the searing heat of the summer streets and best of all my Dad having an enormous tear-up with a taxi driver which resulted in us piling in to the taxi, shouting a lot, then getting out again without having got anywhere. And I was excited to return. Now, like then it is August and Athens is sweltering. The cooling breeze that made Chios (where I’d been for a wedding) delightfully temperate was absent, and I chose the mad-dog Englishman approach to exploring, charging round in the heat of the day, seeking shade where it was offered. Nearly 20 years on, Athens felt familiar and different. The wide streets were there, as were the street-side caves of Kolonaki and the sense of gentility mixed with raw, youthful energy that I found thrilling last time. I am no longer a slightly awkward teenager wearing a loud shirt and straw hat, but my love of history and charging round cities remains. Athens did not disappoint. My flight from Chios landed at 8am, leaving me 11 hours before my next hop home to London. I was able to leave my bag at left luggage – €4 for a half-day, and get a metro trip into town and back for €14. The train took 38 minutes to get one stop short of Syntagma, where if the Acropolis is your only goal you an change lines and be whisked to the foot of the legendary rock. I hopped out Evangelinos, from where the Byzantine Museum is a quick stroll away. It was a treat which skilfully filled in the blanks between Roman and Ottoman occupation, and viewed late antiquity through a Greek prism. The icons were particularly spectacular and it made for a better introduction to the Byzantine World, ironically, than anything to be found in Istanbul. The copies of iconic mosaics from Ravenna and Constantinople, painstakingly recreated by masterful modern scholars of the form were a delight to be able to inspect. 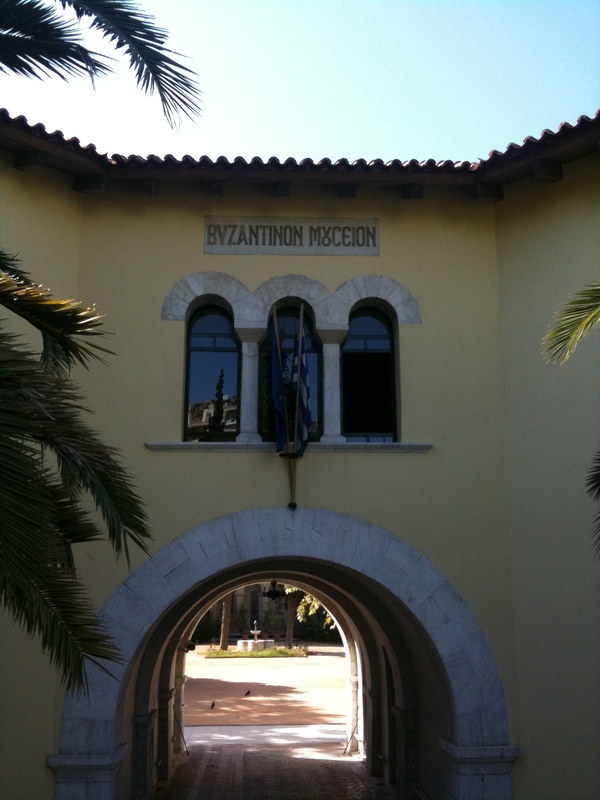 After a quick visit to the British Council, where Patrick Leigh Fermor worked for a while and a cafe where you could feel his ghost scribbling away in the sunshine it was on to the Benaki, which for reasons I’m not entirely sure of was huge fun. It was bright and airy with a terrace cafe affording my first glimpse of the Parthenon and Panathenaic Stadium. Among many wonders in a wide-ranging collection they had a drawing of Athens in its classical pomp by Edward Lear. I wanted all their books, especially some stunning bilingual works on Greek architecture. From here I must add a note of caution. I’m footsore and a little sunstruck after doing what I did and would recommend an edited version of this. On the other hand I saw a huge amount and made the most of the day. 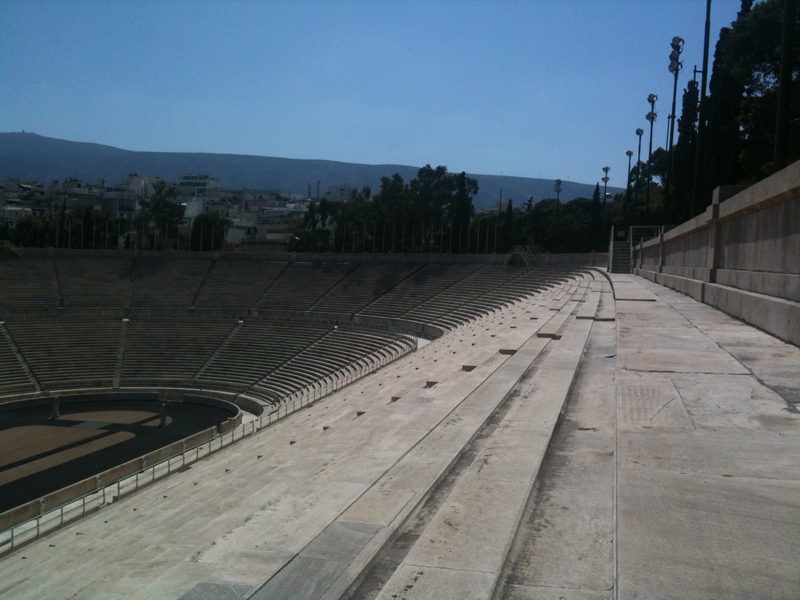 The Panathenaic stadium, venue for the 1896 games was terrific value at €3 including an excellent audio guide. I walk on to Syntagma, Monstiraki and the flea Market (underwhelming) and on to the pedestrian promenade the links the market to the Acropolis via a host of ancient treats. I hopped up the Pnyx, saw the theatre of Herodus Atticus and ogled the Parthenon from a wide variety of angles before diving into the Acropolis Museum. In case you’re wondering, by this point I was sweating profusely and opted out of the hike up to the top in the afternoon sun. The new Acropolis Museum is now 7 years old, which feels scarcely believable. It is a key sight and deals quite marvellously with the Elgin Marbles issue. The museum’s presentation of the friezes eloquently and without hysteria makes the case for their return. It is convincing, informative and above all keeps the constant theme of telling the story of the Parthenon while leaving the visitor to draw their own conclusions. It is another place with a superb viewing terrace. Outside, it was back to the glorious sweat of the Athenian wanderer. It’s easy to get lost, or lose the tourist crowds, in the backstreets of Plaka, and I loved the walk to the Agora as much as rambling around this huge site. On your way out on the Monastiraki side there are lots of lovely cafes to refuel in. Lastly, a few other small notes in case you’re wondering: Athens was orderly, clean and friendly. It was not expensive and eating was very reasonable – €4 for a souvlaki and coke at a cafe in a lovely square is a good deal in western Europe in August. Athenians are friendly, proud of their city and seemed delighted I was there. 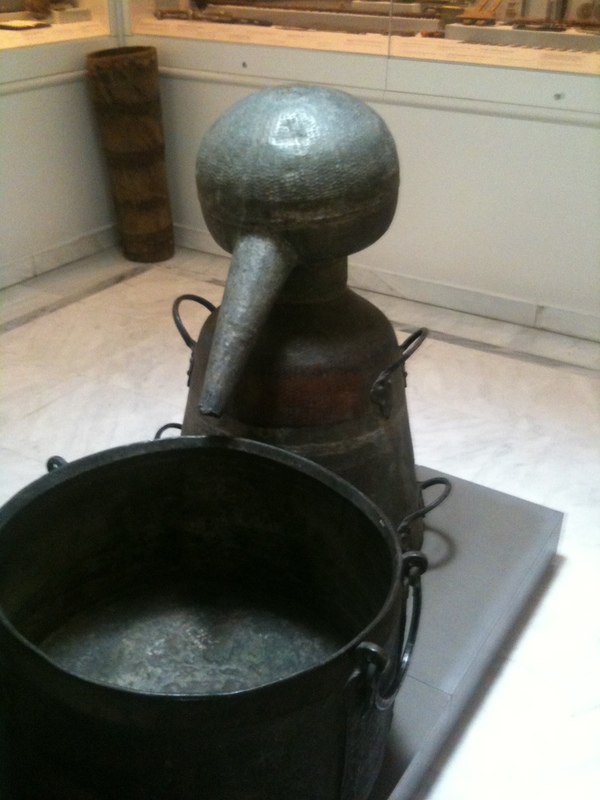 In every room of every museum I went in, even the busy Acropolis Museum, guards grinned and said hello. It will not be 20 years before I next return. 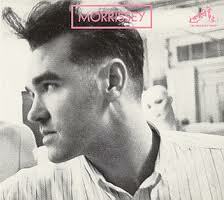 It is 1991, and Morrissey is at his most handsome, about to surge to the peak of his powers as a solo artist, a post-Smith. From the single My Love Life up until the incomparable Vauxhall and I the Mancunian singer produced an unbroken string of classic records that tower over much of the rest of his work. The journey is a decidedly odd one. Kill Uncle, his second (proper) solo album after the rightly-revered Viva Hate, is an elusive record. Written with Mark Nevin (best known for recording with Fairground Attraction and Kirsty MacColl) and recorded with session musicians (Andrew Paresi, who documented his experiences in the BBC radio documentary I Was Morrissey’s Drummer) and those roped in from other bands (Madness’ Bedders), the album was short and at times bizarre. The singles (Sing Your Life and Our Frank) were light and breezy, but the rest of the album is loveable in parts and instantly forgettable in others. The first side of the record ends with the enjoyable Mute Witness and, Morrissey’s funniest ever song, King Leer, veering towards music hall, camp and winsome. The flip side, barring the lyrical high of Driving Your Girlfriend Home, can only be described as a palate cleanser for what comes next. What came immediately next was Morrissey’s return to the live stage for the first time since the legendary free concert at Wolverhampton Civic Hall in December 1988 where he had taken to the stage with his former Smiths, minus Johnny Marr. The extensive Kill Uncle tour was to be different, and an all new band was recruited. Before this tour (if anyone can confirm if first contact was for the video for Sing Your Life, which has both Mark Nevin and Mozzer’s soon-to-be new band playing at Camden Workers Social Club then I’d be grateful, as I’m stumped to be any more precise) Morrissey had met Alain Whyte and through him other rockabilly enthusiasts Boz Boorer, Gary Day and Spencer Cobrin. After Sing Your Life they became his band. The effect of working with these new influences was immediate – compare Pregnant for the Last Time with anything on Kill Uncle. Harder, faster, shorter and with quiffs not harking back to the halcyon 60s but the Psychobilly scene where punk and rock and roll met. Funnily enough, Pregnant for the Last Time stands up well in a chronological listen to Morrissey’s singles, though the fork in the road between a pop past and a rock future is clearly here. Isn’t it? And yet, the path is laden with wrong turns for the listener, and makes for a confusing journey. 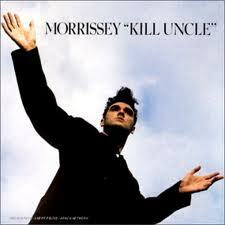 Morrissey released Kill Uncle in March, 1991. The second single, Sing Your Life, was released in April. Pregnant For the Last Time follows in July, with Whyte, Boorer and co playing on it but written by Nevin. It whacks along. You feel like you can draw a straight line from this to Your Arsenal’s bolshy bits. Yet what comes next is a blast of melodic loveliness in the shape of My Love Life which came out in September. 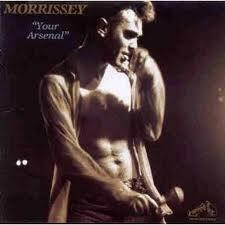 This near last-gasp of Morrissey’s partnership with Mark Nevin was arguably the best thing they recorded together, though I Know It’s Gonna Happen Someday from Your Arsenal runs it close. 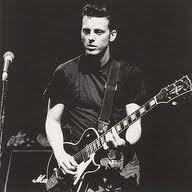 Nevin also has writing credits on Glamourous Glue, though Alain Whyte has the rest of the tunes on the album in his name. Throughout this time the link with Kill Uncle’s distinctive sound weakens, mostly driven by Morrissey bonding on and off stage with his new bandmates and the resulting creative output. I was too young to see any of the Kill Uncle shows, first seeing Morrissey live at Alexandra Palace in December, 1992, after an abortive attempt to see him supporting Madness at Finsbury Park that summer. He had been bottled off by skinheads the day before and had decided against dancing round the stage draped in a Union Flag. My knowledge only comes through Live in Dallas, an easy-to-find document of the Kill Uncle tour, and shows how Boorer, Whyte, Day and Cobrin were shaping up as Morrissey’s band. Rockabilly, fast-paced romps through material that wasn’t their own, with blasts of the sound that was to surface on Your Arsenal. The tour is documented in Linder Sterling’s brilliant Morrissey Shot, which shows a gang of young men on a hysteria-fuelled adventure round the world set to a changing sound. Nevin’s contribution to Your Arsenal, that controversial classic, is often overlooked as it suits a linear view of history to assume Whyte, Boorer and producer Mick Ronson gave that lame-coated masterpiece its identity. The truth is more complex, and makes for an enjoyable Saturday night with some of Morrissey’s loveliest record covers and most interesting songs. I’m not entirely sure why I decided to buy it that day. I could have heard somewhere about a record label that was right up my street. I may have noted something on the radio that caught my ear. It’s just as likely though that on that warm summer’s Saturday in Reckless Records on Camden High Street I picked up Fountain Island, liked the cover and, with a fiver (£5.25 to be precise) in my pocket, took a chance on it and carried it home. 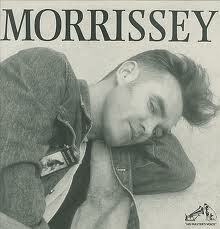 I was hooked before the tube ride had finished and I’d got it on the stereo. Staring at the sleeve of something you’ve just brought while going home did that sometimes. 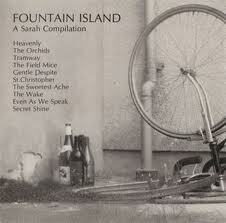 Fountain Island was one of the classic compilation LP’s Sarah Records put out throughout the labels life, collecting songs otherwise only found on singles. The artwork, benefiting from 12-inch rather than 7-inch size covers, reminded me of back gardens and sun-baked suburban streets. Once on the turntable I was quickly hooked by the mix of gentle and more urgent guitar music, which carried a strong antipodean flavour to go with the more expected Bristol fuzzy noise. I now count some of the bands on that LP as my favourites: the Orchids, the Sugargliders and some that only my brother and I seem to know and cherish: Tramway, take a bow. Fountain Island got me hooked on Sarah. This record label, I quickly learned, was run by Clare Wadd and Matt Haynes, from a PO Box in Bristol. I wrote off to them for some singles and, when they came back I had a hand-written reply with some thoughtful responses to what I’d asked them. Over time, I came to look forward to these notes as much as the music. When I got good enough GCSEs to go to Sixth Form College Matt sent a pat on the back. I still have the note. Record inners came decorated with pictures of branch line services from Bristol. Mini-catalogues backed with hand-cut collages of tight-typed prose about love and loss. Here’s one, in lieu of me being sufficiently organised to scan my own ones. Besides, they’re personal. Sarah had been going for a few years by the time I had cottoned on to it. Just like every musical movement ever, you should have been here a few years back. I didn’t care. I’d never found anything I liked doing more than going to the football, but rooting round record shops in search of missing Sarah seven-inches came pretty close. Most other articles about Sarah descend into dullard cliches far too easily, labelling its output fey and winsome. Critics lack the respect and imagination to listen any further. 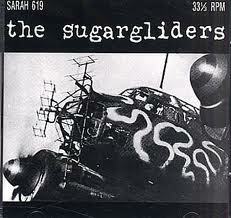 The Field Mice and Heavenly are, to those lazy ears, the sum total of Sarah’s contribution to music, with a caustic nod to Pristine Christine by the Sea Urchins, the very first Sarah single. iTunes will prove the nonsense of this position. By all means have a listen to the Field Mice and Amelia Fletcher’s timelessly sharp lyrics, but also take the time to find Secret Shine, Blueboy, Brighter, Even As We Speak and Tramway. I shall keep mentioning the latter band until anyone reading this buys ‘Maritime City’. I’m not sure there’s ever been a record quite like it. You can hear the b-side here. St Christopher’s blazing rendition of All of a Tremble is another excellent introduction to a wonderful and underrated band. Anyone else have a Sarah favourite to share?